Ecosystem succession, also called "ecological succession," is the process through which a natural community of plants and animals changes after a disturbance. It is generally understood that ecological succession is a progressive movement towards the most stable community (also called a "climax community"). This kind of succession is the manner through which natural communities respond to disturbances and changes. Disturbances to natural communities can be both elemental and man-made. Fires, floods, wind storms, landslides, and avalanches are some examples of elemental ecological disturbances. While logging, mining, farming and urbanization are examples of man-made disturbances. Primary ecosystem succession is when a community first forms in a newly created or exposed area such as a sand dune or bare rock surface, lava flow, or a new lake created by flooding. In a sense, this is as if the community forms from a "clean slate" ecologically speaking. Secondary succession is when a community was disturbed by human or elemental forces. This form of succession tends to be much more rapid as some of the vital elements such as soil, nutrients and seeds are already present at the location at least to some extent. An example of this kind of succession is a forest recovering from a major forest fire or logging event. Cyclical succession is when a community is changed by recurring events or changing interactions with species of plants or animals. An example of this is the repeated fire cycles of the coastal chaparral ecosystem of California. Read more about it below. One example is the coastal chaparral of California. This type of ecosystem has a climax community that is composed of shrub-sized deciduous and evergreen vegetation. 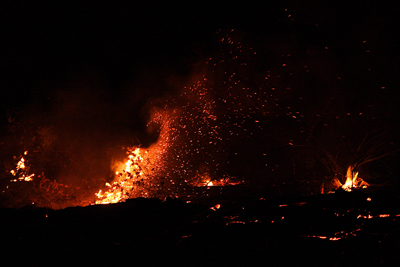 Fires are the major source of disturbance in this ecosystem. Fires come through in cycles of between 10 and 15 years or sometimes longer. The plants and animals here must be adapted to long periods of dryness and mild, winter time precipitation. When fires occur, the plant life can recover relatively rapidly and return to similar climax community in less than several years. Another type of ecosystem succession is represented by the old-growth coastal temperate rainforests of the Pacific Northwest. Here the climax community is a complex of tree species of various ages and sizes, but is dominated by giant, old Sitka spruce, western red cedar, coast Douglas-fir and western hemlock. This forest experiences some disturbances from windstorms, flooding and very infrequently, from fires. Plants and animals in this ecosystem must be adapted to frequent precipitation, cool to cold temperatures and relatively short summers. When major, catastrophic fires occur here, the climax species take a long-time to recover to pre-fire state and reach a climax community. Some of the forest giants such as Sitka spruce and western red cedar may take several hundred or more years to reach full old-growth stature. Also, the complex relationships these trees form with other organisms such as fungi, other plants and animals may also take a very long time to be re-established. A final example of ecosystem succession is that of an abandoned lot in a big city. Let's take an abandoned lot in Seattle for example. At first, species such as mosses grow across the exposed concrete. The seeds of dandelion, hairy-cat's ear, chickweed and different grasses species grow in the cracks of the concrete and on any exposed soils. With time, they make room for small shrubs such as salmonberry and wild rose. Then pioneer trees, such as red alder take root. They fix nitrogen, and prepare the soil for other trees to move in eventually. In such an urban location, many non-native or even invasive species may occur on such a site. Himalayan blackberry may end up taking over and shading out most of the other plants on this lot. It is important to remember that succession is a process that is happening all around us all the time. It is the means through which the natural world recovers from disturbance, and it is a process vital to the survival of plant and animal communities around the world. Every ecosystem has its own natural patterns of succession and disturbance. What is the natural ecosystem succession pattern where you live? Learn about ecology and nature skills at Alderleaf Courses.